Not long after we started dating, I began to realize how amazing this girl was ... not "shiny" amazing, but downright through-and-through marvelous. She was talented, lovely, frugal, good-natured, competitive, adventurous, and genuine. She made sensible decisions, took care of herself, practiced great Lordship, and was good at steady communication. And she had tremendous depth to her ... she longed to be loved, cared deeply about people, truly listened, saw kids on their level, and proved over and over again that she was absolutely fearless. And she was so good to me ... patient, gentle, helpful, challenging, and all about Proverbs 31. Kristen was most definitely the girl I wanted to learn to serve and love forever. But I also learned, early on, that one of the greatest ways I could care for her was to move at her pace, to allow her to discover our relationship in time and slowly step into "us". I figured that it'd take Kristen's family a while to really get used to me as well, and I knew that if my desires were truly in line with God's, then what we had would only get better with time. So I tucked my impatience into my pocket and pursued her slowly, waiting for His time to become ripe. As we neared our two-year dating-iversary, Kristen and I decided that we needed to take a couple of personal days for a mini-vacation, to get away a bit before the last month of school. We decided to use the morning to gather all of the notes, gifts, emails, and photos we'd been saving for the past two years and start a scrapbook together ... and I told her that I'd get tickets to something fun for that evening. So after watching some sports and volunteering at the local marathon over the weekend, Kristen came over to work on the scrapbook Monday morning. She was about to burst with curiosity about the other plans I had made, so I didn't wait long to present her with her gift ... two tickets for a skydiving adventure in Middletown! 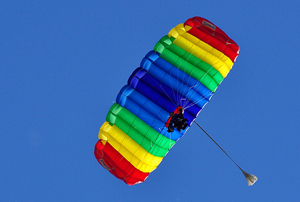 Little did she know, however, that jumping out of a plane was merely the prologue. 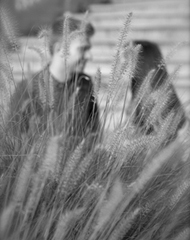 For months, you see, I had been concocting a plan to propose to my lovely. I had dinner with her parents about a month earlier, asking for their blessing and receiving some fantastic advice about our future together. And I did the same with my parents, seeking their wisdom for our relationship. 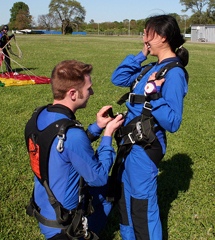 I also contacted several close friends and invited them to be a part of the experience, then I started investigating skydiving companies in the area ... because what could be better than falling to the ground at 120mph, only to see a giant sign on the ground asking if she'll marry me? So after a hearty lunch and a change of clothes, we jumped in the car for the hourlong drive to Middletown. At each stoplight along the way, I was texting back and forth with my "ground crew", the friends I had asked to paint the giant vehicle-sized letters on the airport grass (using 32 cans of spray paint!) ... and as we got closer to the airport, they informed me that it was taking longer than we thought it would to paint the sign. I stopped to get gas. I stopped to go to the bathroom. I got lost two or three times. 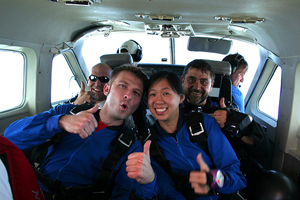 I feigned nervousness about the skydive. And once I was plum out of ideas, we pulled the car over at a dinky yard sale and I acted like I was interested in buying an old rusty park bench ... for about 15 or 20 minutes. It was absolutely ridiculous ... but as always, Kristen was abundantly patient with my intolerable behavior. Finally, I got a text saying that the sign was painted and the airport was ready for us, so we jumped back in the car and drove around the corner to the hanger. Once inside, we signed the release forms, watched the hilarious instructional video, and suited up in some fancy blue jumpsuits. I kept asking Kristen if she was nervous, but she wasn't phased at all. Even when we got in the plane-without-an-actual-door and climbed two miles into the sky at a 45-degree angle, she was cool as a cucumber! Not me. I was excited about the jump, sure ... but even more pumped about what would happen afterwards. It was nice, really, to be able to disguise my feelings about the proposal by simply saying that I was nervous about falling from the sky ... but what I really wanted was for it all to just simply happen. So yeah ... the freefall was exhilerating, gliding under the parachute was one of the most calming things I've experienced, and spiraling rapidly to the ground in the chute to get there before Kristen was quite exciting ... but the moment before she landed seemed to last forever, like I was living out a two-hour movie about a boy just waiting for the girl of his dreams to (literally) drop out of the sky. Then she touched down, and all of the words I had meticulously planned just disappeared. The local radio station, newspaper (here's the article! ), a photographer, some friends, and a bunch of strangers had gathered around ... but at that moment, they all kind of faded away and time just hung there. 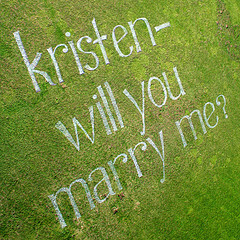 After a couple of clumsy words, I got down on one knee and repeated the question I hadn't heard her answer in the sky. And thankfully, her answer was "yes! ", so I slid the ring on her finger and that was that! We laughed and cheered with our ground crew, called up our families, then went to Olive Garden to celebrate with a couple dozen friends that I had invited ahead-of-time. While there, we even got to watch a video of the jump (you can see it below)! After a couple of clumsy words, I got down on one knee and repeated the question I hadn't her her answer in the sky. And thankfully, her answer was "yes! ", so I slid the ring on her finger and that was that!